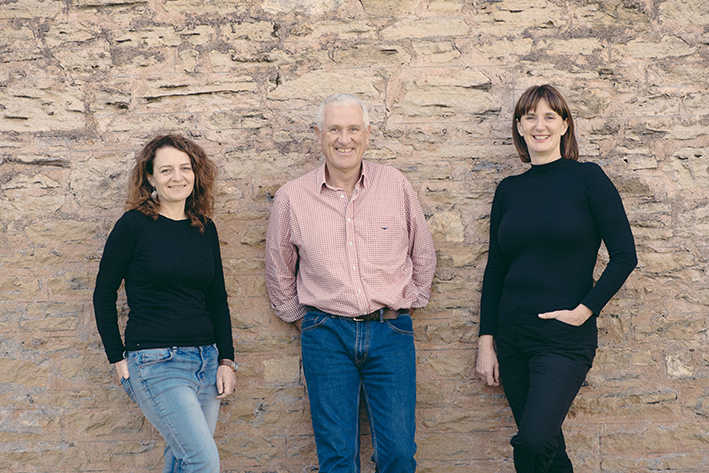 Wynns Winemakers Sarah Pidgeon (left) and Sue Hodder, with vineyard manager Allen Jenkins. The three presided over one of the greatest vineyard and winemaking makeovers in Australian history. 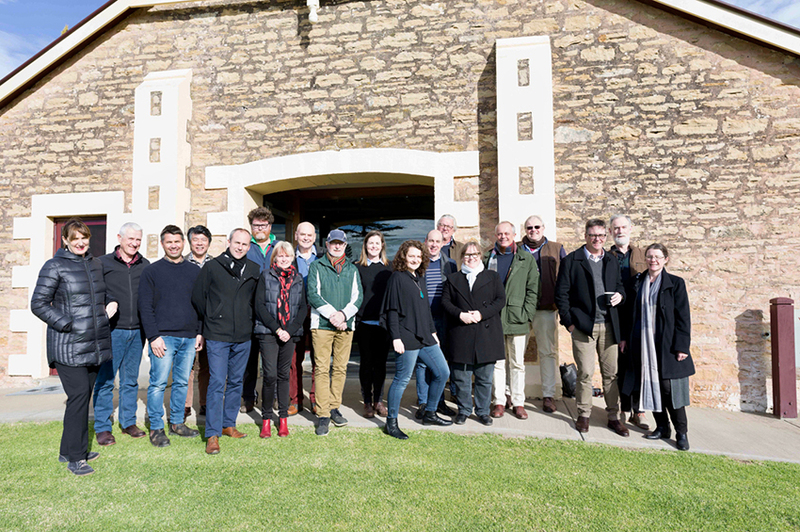 A sixty-vintage tasting of Wynns Coonawarra Estate cabernet sauvignon on 12 and 13 July 2017 proved the amazing beauty and keeping power of this great Aussie red. Not that this was any news to the tasters. Many of us gathered at Wynns had participated in a similar tasting in 2004 – and we’d drawn the same conclusion: Wynns makes one of the world’s best, and best value, cabernets. The 2004 tasting propelled winemaker Sue Hodder and vineyard manage Allen Jenkins, further into their long-term project of finessing an already proven wine style. In particular, the elegant beauty of the 1960s wines inspired Hodder. At this year’s tasting we yet again marvelled at the older wines, many of which tasted much as they had 13 years earlier. More importantly, though, the tasting allowed us to appraise the new wines now so clearly benefiting from all the vineyard and winemaking changes Hodder and Jenkins so thoughtfully implemented from 2000. The links below give details of those changes. I elaborate on them in my tasting notes below. The colour of age: Wynns Cooonawarra Cabernet 1954 to 1959.Photo: Chris Shanahan. 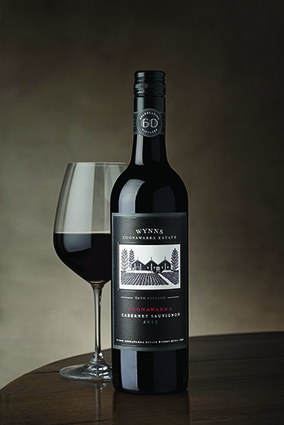 With the exception of the 1955 and 1956 vintages, Wynns cabernet sauvignons from 1954 to 1962 were labelled ‘cabernet’, not ‘cabernet sauvignon’. The 1955 and 1956 wines, blends of cabernet sauvignon (80%) and shiraz (20%), were labelled ‘claret’, consistent with Australian generic labelling of the time. In the 1950s, noted winemaker Sarah Pidgeon, Coonawarra grew more shiraz than it did cabernet sauvignon. From 1954 to 1964 the labels were white. The black label, which ultimately became the wine’s name, first appeared on the 1965 vintage. Mid, limpid colour, brown at the rim; warm, sweet, earth, mushroom and chocolate-like aroma; elegant, refined old palate reflecting the aroma; still sweet and juicy with varietal character. Lovely, harmonious old red. Note, two bottles opened for the group, Huon Hooke (born 1954) led the discussion of the fifties vintages noted his bottle not in as good condition as the one I tasted from. Similar colour to the 1954; sharper, more aged aroma; faded power here, still with intense flavour but a little tart and drying out. It doesn’t have the harmony of the 1954, but it’s still a delight to drink, albeit fading. The other bottle was apparently fresher. A tone lighter in colour than the 1954 or 1955; aged, autumn-leaf aroma with a pungent edge, but still with old-cupboard charm; soft, sweet and gentle on the palate, with an elegant structure and fine, lingering finish. Light but lovely. Brown rim, a shade darker than 1956, but comparatively light in the line up. Less volume of aroma than 1954–56, earthy, savoury and aged – all the old, earthy elements, then a dry, quite tannic palate, firmer than 1954–56. Less ripe in flavour. Deeper hue than preceding wines; very old, chocolaty aroma of extreme age; very full, round palate – plusher than 1954–57 wines, with quite strong, firm tannins. Drying out, but with a trace of sweet fruit still there. Light to medium colour with brown rim; highly aromatic, reminiscent of old leather and autumn leaf, with a tart punch; elegant structure, intense palate with lingering aged and chocolaty aftertaste – fine tannins in harmony with the sweet, aged fruit. Wonderful old wine, with a touch of Coonawarra mint in the aftertaste. The early vintages wore white; the black label arrived in 1965 and the name changed from ‘cabernet’ to ‘cabernet sauvignon’. No cabernet sauvignon wine was produced in 1961 (frost) and 1963 (wet). Vintages 1960, 1962 and 1964 bore the word ‘cabernet’ on a white label. 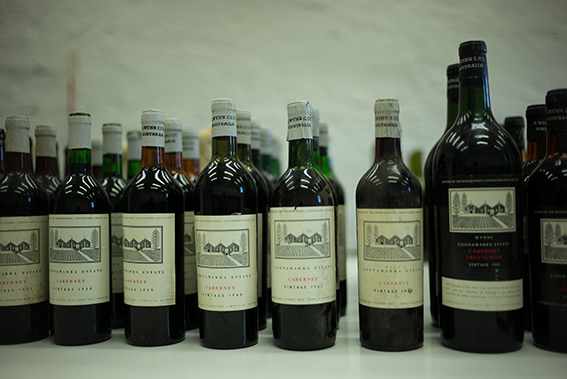 The 1965 vintage was the first to bear the black label and the full varietal name ‘cabernet sauvignon’. Deep colour with brown rim; aged varietal aroma, both earthy and sweet; aged but vibrant palate with deep, sweet fruit, lively acid and assertive cabernet tannins all in harmony. Fresher on the palate than the aroma suggested. A frost year, not produced. Slightly lighter colour than 1960, brown at rim; warm and inviting aromas combining sweet fruit and a patina of autumn-leaf and other aged characters; elegant palate, finely balancing acid, tannin and intense fruit. A gorgeous old beauty. A wet growing season, not produced. A shade darker than the 1962, brown at rim; sharp, thrusting aroma revealing great age; the palate reflects the aroma – tannins now outweigh the fruit, and there’s a green, unripe note too. This was the driest season of the decade. Deepest colour of the 1960–65 group, brown at rim; chocolate-like aroma of age with a sniff of decay; big, tannic palate, tannin edging out the fruit. A powerful wine, now in decline. Deep colour, but a shade lighter than the 1965; a harmony of fruit and age on both nose and plate and so fresh for its age. Long aftertaste. A great wine. Similar depth of colour to the 1966, perhaps a little more brown at the rim; the aroma combines aged character with freshness; the palate is fuller and rounder than the 1966, with a solid bite of tannin taking over the finish. Similar hue to 1966 and 1967; the aroma combines surprising fresh Coonawarra berry character, overlaid with age and a touch of mint; the berry and age characters flow through to the palate, along with a firm bite of tannin. Aged colour; some sweet, inviting elements in the aroma, but the palate seems all tannin and oxidation. (A co-fermented cabernet sauvignon and shiraz (at the time also known in Australia as ‘hermitage’. A poor year). Sue Hodder says there were young vineyards contributing in this decade. Allen Jenkins calls it the wettest of the decades in review, meaning leafier canopies as a result of the higher rainfall. 1976 experienced the warmest flowering, setting the season up well. He says, ‘1978 was another average season, the sort we now look out for as a good year’. Medium depth of colour, brown at the rim; aroma of berry, mint, cedar and aged character; medium-bodied, ageing palate, still with fruit, but slightly outweighed by tannin. Medium to deep colour, brown at the rim; exuberant aroma combining fruit and age; lively, vigorous palate of sweet fruit and age in harmony with both high acid and assertive tannin. Medium to deep colour, brown at rim; warm, decaying aroma of age; a little sweet fruit on the palate but not enough to hold off the tannin, leaving the palate hollow and the finish to acid and tannin. Medium to deep colour, brown at rim; aged but fresh aroma, showing berries, leaf, and a mellow, earthy, sweet, character of age; sweet fruit tempered by age dominate a fine, firm, harmonious palate. Medium to deep colour, brown at rim; an initial impression of darker fruits than in the other 1970s wines, but also signs of decay; the palate is full but hot and dominated by tannin as the fruit slips from sight. Medium to deep colour, brown at rim; warm, ripe aromas of earth, age and sweet black-olive-like varietal aroma; the palate combines sweet fruit, age and firm tannins, with the tannins now dominant but overwhelming. The first bottle was not in good shape. It revealed a big wine in which tannin outweighed fading fruit. A second bottle served at dinner that night (alongside Chateau Latour 1975), drank beautifully – showing great perfume, power and supple, deep fruit in harmony with its tannins. One of the best. Medium to deep colour, brown at the rim; leafy, aged aroma; lean, austere palate, albeit with a lick of fruit, though subservient to the tannin. Medium to deep colour, brown at the rim; big, chocolaty aroma with leafy and aged character; full bodied in this line up, but the palate is hollow and tannins take over the finish. Medium to deep colour, brown at the rim; aged, chocolaty aroma with something tart and tangy pushing through; a big palate, with more sweet fruit than in the 1977 or 1978. But without flavour concentration, the fruit rolls over to the tannin. Wynns’ gables, built by Coonawarra founder John Riddoch. Medium colour, watery brown at the rim; herbaceous, vegetal, unripe aroma; a skerrick of sweet fruit on the palate gives way to tart acid, consistent with the aroma, then firm, hard tannins. Medium to deep colour, brown at the rim; aged aroma combing both ripe and herbaceous fruit; big, sweet, round and juicy palate with mild tannins. Medium to deep colour, brown at the rim; aroma of ripe berries, overlaid with sweet, aged character; generous, sweet, plush palate, still with lively berry flavours, though overlaid with lovely, mellow aged characters. Elegant, harmonious palate with lovely tannins complementing the fruit. One of the best. Deep colour, brown at the rim; earthy, savoury, aged aroma, with leafy cabernet sauvignon character; aged character and firm tannin lead the palate, with a mere skerrick of sweet fruit remaining. Medium to deep colour, brown at the rim; leafy cabernet sauvignon and berry combo in the aroma; fresh, acidic palate with leafy flavours, then lean, unripe tannins. Deep colour, brown at the rim; big, savoury aroma, a little oxidised; big palate with sweet, ripe fruit at the core, then loads of tannin slightly outweighing the fruit, though no overwhelming it. Deep colour, more brick red than brown at the rim; lifted, sweet, multi-dimensional aroma, with oak, fruit and age – volatile acidity noticeable and probably accounts for some of the aroma’s buoyancy; the palate reflects the aroma in its liveliness, though burly tannins, probably derived from both fruit and oak, detract from what may have been an outstanding wine. Medium to deep colour, more brick red than brown at the rim; attractive aroma combining ripe berry, age and leaf; sweet fruit is at the core of a big, tannic wine, albeit not so overwhelming as in the 1986. Deep colour with more brick red than brown at the rim; big, ripe aroma combining freshness with age; ripe, sweet fruit on the big palate, followed by similar burly tannins seen in the last few wines. There’s a winemaking style running through these vintages. Medium to deep colour, more brick red than brown at the rim; attractive, sweet aroma combines fruit, oak and age; after a run of tannic wines, the 1989 presents a gentle, comparatively soft palate; cabernet and oak tannins nevertheless provide structure, but without overwhelming the fruit or becoming a dominate feature. A surprise for such an unsung vintage. Sue Hodder described the, ‘Many heralded vintages in this decade’, while Allen Jenkins saw the period as, ‘Even in temperature, more so than the other [decades] and drier. A dream decade’. In a discussion after we tasted this bracket, Jeremy Oliver suggested tannin had been added to the wines. Sue Hodder countered that the tannin had been fruit and oak derived, noting the oak Wynns used in the 90s was, ‘Not a patch on what it is now’. She added, ‘We were compelled to make as full a body as possible as medium bodied reds were not then accepted’. She went on, ‘The wines were forced a bit’. In an attempt to get away from green flavour, fruit was given greater hang time than it once had, which meant a higher pH and less brightness. Sue noted that in the 90s oak comprised roughly 20% new across the decade, with an American oak influence in the first half. She lobbied for and got French – but was not anti-American. It simply didn’t suit Wynns wines. Deep red colour to the rim, with little sign of ageing; aroma of ripe plum, black olive and a warm, earthy, ageing character; clear, varietal cassis-like flavour in an intense palate of great vitality, with firm varietal tannins in harmony with the fruit. One of the best. Similar colour and hue to the 1990; mellow, warm, aged aroma with notes of chocolate and mint; sweet, harmonious palate, vibrant and fresh despite the age, with a fine, elegant structure. A wonderful contrast in style to the 1990 and of a similar stature. Medium to deep colour, more brick red than brown at rim; aged aroma without the freshness of 1990 or 1991; big palate, dominated by tannin, despite a vein of underlying fruit. Medium to deep colour, brown at the rim; warm, chocolate and leafy aroma with earthy, aged character; high acid, high tannin palate, looking tired and dried out. Medium to deep red, some signs of age at the rim; berry, leaf and age in the aroma; medium bodied, fresh and appealing palate of sweet berry flavours and age, with a modest bite of tannin in the finish. Deep brick red colour, some signs of age at the rim; big, black-olive and cassis aroma with an overlay of oak; full-bodied, round – a matrix of fruit, oak and tannin, with tannin ascendant. Deep red, still youthful at the rim; gorgeous floral aroma – a complex of fruit and age; lively palate, saturated with sweet, succulent fruit, held firmly by cabernet tannins. One of the best, with years ahead of it. We were served two glasses – one from bottle, the other from magnum. The condition of the wine in the two bottles varied. For some of us, the wine from the better bottle proved to be in better condition than wine from the magnum. Deep colour, ageing at the rim; spiky, very old aromas; still has sweet fruit on the palate, though the tannins sweep through and dominate. Deep colour with youthful tone at the rim; lovely, inviting aroma of ripe plum and dark berries, with subtle aged notes; ripe, plush palate, supple and pulsing with life; firm tannins grip the fruit in a potentially long-lived cabernet. One of the best. Deep colour with youthful tone at the rim; lifted, sweet-fruited aroma – lovely, classy cabernet sauvignon with a little age; subtle, elegant palate of deep, sweet fruit, interwoven harmoniously with firm tannin. One of the best – and an elegant contrast to the bigger 1998 (reminiscent of the 1990—1991 pairing). Tasters at work, Wynns Coonawarrra Estate. Photo: Chris Shanahan. 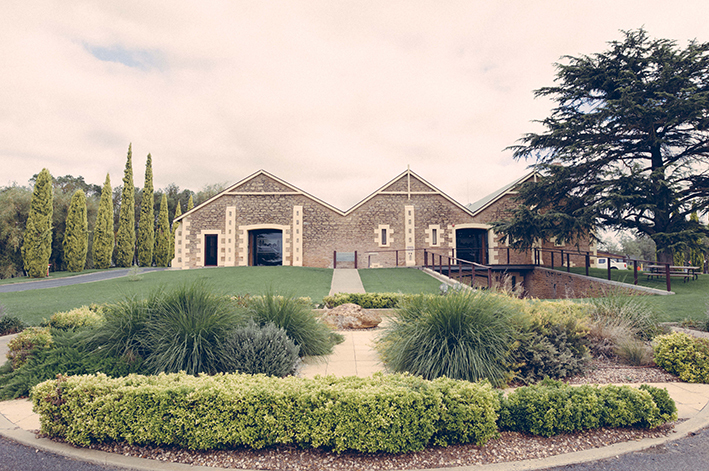 In this period, Sue Hodder’s study of older Wynns vintages led to dramatic vineyard renewal and a new purpose-built winery. Greater control of fruit quality and harvesting time, backed by a winery capable of handling multiple small fruit batches, lifted wine quality. Use of oak changed for the better as Sue’s team appraised barrels of differing sizes from various forests and coopers. She then designed maturation regimes for each of the Wynns wines. This work is ongoing – for example, the just-released 2015 Black Label was matured partly in 3000-litre vats, much as the earliest vintages were. Winemaker Sarah Pidgeon described the oak quest as, ‘An epic journey to get the balance right’. The progression from 2000 to the present sought coopers whose barrels, ‘Push up our fruit’. The introduction of the screw-cap seals from the 2006 vintage eliminated perhaps the most egregious risk to wines intended for long-term cellaring. As we saw time and again in this 60-vintage tasting and a similar event in 2004, cork-related oxidation, meant wide variability in the condition of the wines we tasted. As two bottles of each wine were required for the tasting, for any vintage some in the group tasted excellence, while others suffered a lesser bottle. This proved dramatically so with the 1954 vintage. Future drinkers won’t encounter this problem with wines made from 2006. After we tasted this bracket, Huon Hooke asked Sue Hodder about the acidity, ‘Which is so even in these wines’. Sue said the wines now require less acid adjustment than in the past thanks to improved canopy management, earlier ripening and earlier picking. After previous winemaker Peter Douglas left, she felt compelled to continue making big wines. But inspired by the wines of the 1960s, she moved to a medium-bodied style. ‘It was a long journey in vineyard and winery’, she said. Winemaker Sarah Pidgeon commented on even greater control of fruit. In the 2015 vintage, she said, Wynns commissioned a berry-sorting machine of a style used in Europe and Western Australia for some time. Berry sorting further improved the evenness and quality of fruit going into the wines. Medium to deep colour, still red at the rim; fresh, bright, youthful aroma of red berries, overlaid with age; the palate reflects the aroma, with a structure based on comparatively high acid and fine, firm tannins. Medium to deep colour, youthfully red at the rim; ripe, plummy aroma with a touch of leaf, black olive and age; vibrant palate, with intense, ripe fruit flavour meshed with firm tannins, all in harmony, with finesse. Medium to deep colour with, signs of age at the rim; warm, plummy, maturing aroma, with an earthy, autumn-leaf character; luscious palate – mature and earthy but with life and fruit, then fine tannins sweeping through on the finish. Medium to deep colour, signs of age at the rim; sweet, aged aroma with a lick of oak still apparent; full palate, but the fruit struggles to push through the substantial tannins. Deep colour, with vibrant red, still youthful rim; fresh, ripe-berry, varietal aroma – very even and balanced with the first signs of aged character adding complexity; vibrant palate reflects the aroma – pure, cabernet flavour, supple and sweet is cocooned in fine but assertive tannins. One of the best. Deep brick red with first signs of age at the rim; leafy, aged aroma; on the palate vibrant fruit wrestles with strong tannin, the latter winning at this stage, but by no means overwhelming the fruit. Medium deep, still youthfully red at the rim; ripe, fresh aroma, combining plum- and black olive-like varietal character with maturation character; supple, full, fruity palate of considerable depth with a nicely balanced load of cabernet tannins. Neither young nor aged, but has long cellaring potential. Deep colour with vibrant, youthful rim; deep, sweet, plummy aroma, with fruit to the fore, although there’s much more to it; the vibrant palate is saturated with varietal flavour, meshed harmoniously with firm, fine tannins. One of the best, and barely into its long evolution. Deep colour with crimson rim; big, rich, sweet-fruited aroma; fleshy, plush fruit floods the opulent, firm, tannic palate. From a hot year, this is at the bigger end of the Coonawarra cabernet style, but it’s harmonious and built to last. Deep colour with crimson rim; deep, dark fruits in the aroma, with a touch of sweet oak; big, opulent, warm palate with alcoholic heat taking the edge off the fruit – a comparative block buster, finishing with very strong tannins. Deep colour with vibrant crimson rim; gorgeous aroma, combing floral high-notes with ripe, red fruits and savoury oak; supple, deep, fruity palate reflects the inviting aroma; firm tannins combine with the fruit in a wine of complexity and elegance. One of the best. Medium to deep colour, with youthful rim; sweet, fruity aroma reminiscent of summer berries, with a splash of leaf and spicy oak; lighter bodied than the preceding three vintages; elegant, refined palate with fresh fruit reflecting the aroma and firm fine tannins in the finish. A triumph in such a wet, cold season. Sue Hodder said very little suitable fruit was produced in the vintage. She said of the scores of vineyards usually contributing to Black Label, only two produced good quality fruit. Allen Jenkins said, “I learned a lot from the 2011 vintage, leading to major changes to manage the extremes of climate change”. Medium to deep colour, still crimson at the rim; delicate, sweet, floral, fruity aroma – alluring, seductive and classy; vibrant palate reflects the gorgeous aroma; fine tannins embrace the fruit, creating a unity of flavour; great harmony and elegance in a very fine, medium-bodied, elegant and potentially very long-lived cabernet sauvignon. A magnificent wine, in a class of its own. Medium to deep colour with crimson rim; deep aroma of black fruits and black olive; these intense varietal characters flow onto a deep, sweet and round palate, layered with firm tannins; a big wine after the 2012, but harmonious and with good future potential. Medium to deep with crimson rim; vibrant aroma of ripe, red fruits; the palate continues the fruity theme promised by the aroma; tight cabernet tannins grip the fruit and give an elegant structure to a very youthful wine. Deep colour with intense crimson rim; opulent aroma combines vibrant, ripe varietal character with deeper underlying savouriness; brilliant fruit saturates a round, juicy palate that pulses with life; ripe, assertive tannins harmonise with fruit in a complete and superior cabernet sauvignon. One of the best. We also tasted representative samples from the 2016 and 2017 vintages, drawn from oak barrels. They are yet to be blended and bottled. Deep colour with purple rim; strong aroma of ripe, dark fruits – mulberry, black cherry; an adolescent on the palate – rampant, untamed fruit with powerful tannins and obvious oak; great potential. Limpid purple colour: all florals and fruit on nose and palate, strongly varietal in flavour with fine tannins at this stage and oak not asserting its influence yet.